In the coming days, the statue of Washington would be repeatedly vandalized by leftists drawing peace signs and “No War” and “War is Not the Answer” slogans on it. But that moment crystallized my realization that while Muslim terrorists had carried out the attack, it was the left we would have to fight. 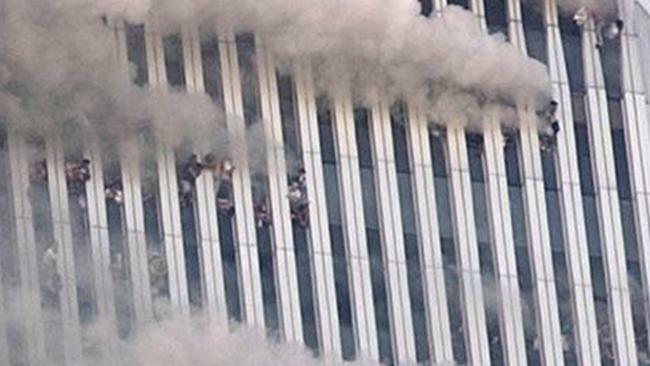 While some New Yorkers had gone to help the victims of Islamic terrorists, the left had rushed to aid the terrorists. Unlike the rest of us, they were not shocked or horrified by the attack. They were treasonously working on ways to spin the murder of thousands of Americans to protect the enemy. And then, after the next round of stabbings, car burnings and terror attacks, they blame the West for not “integrating” the un-integratable millions who had no more interest in being integrated than their leftist patrons do in moving to Pakistan and praying to Allah on a threadbare rug. But “integration” is a euphemism for a raft of leftist agenda items from social services spending to punishing hate speech (though never that of the Imams crying for blood and death, but only of their native victims) to a foreign policy based on appeasement and surrender. Islamic terrorists kill and leftists profit from the carnage. In the UK, Labour used Muslim immigration as a deliberate political program to “change the country.” In Israel, Labor struck an illegal deal with Arafat that put sizable portions of the country under the control of terrorists while forcing the Jewish State into a series of concessions to terrorists and the left. The same fundamental pattern of Labour and Labor and the whole left is behind the rise of Islamic terrorism. With the Muslim Brotherhood, the origin organization of Al Qaeda, ISIS and Hamas, among many others, so tightly integrated into the American and European left that it is often hard to see where one begins and the other ends, Islam has become the militant arm of the purportedly secular left. Western leftists and Islamists have formed the same poisonous relationship as Middle Eastern leftists and Islamists did leading to the rise of the Ayatollah Khomeini and the Arab Spring. Leftists expected Islamists to do the dirty work while they would take over. Instead the Islamists won and killed them. Since September 11, the left has trashed the FBI’s counterterrorism and has now succeeded in destroying the NYPD’s counterrorism while transforming the FDNY into an affirmative action project. What the September 11 hijackers could never accomplish on their own, the leftists did for them by defeating the three forces that had stood against Islamic terrorists on that day. And it would not surprise me at all if some of the “No War” scribblers have gone on to play an influential role in that treason. Nothing detailed, either, about what being “normal people” might mean, given that normal Muslims are taught by their scriptures — Qur’an and Hadith — to behave quite aggressively, even murderously, toward other normal, but non-Muslim people, precisely because many of those normal but non-Muslim people made the terrible and unforgivable mistake of not accepting the Qur’an in its true version, but only in a distorted and perverted version (that goes by the name “the Bible”) that rightly earned them Muslim aggression and hatred. “Misplaced and misguided.” There have been nearly 30,000 terrorist acts by Muslims against non-Muslims all over the world since 9/11/2001, including a number in America, and one of them – you will remember even if Mona Haydar cannot — was a spectacular one in Boston just a few years ago, with the Tsarnaev brothers strutting their murderous stuff at the Marathon’s finish line. Of course there were many questions that might have been asked and that, in her attempting answering, would have met something beyond the feelgood farce that was the order of the day. What would an honest conversation about Islam, making any kind of sense at all, have to be like? It would require paying attention to the canonical texts, the all-important Qur’an (a text revealed to Muhammad over 23 years) and the Hadith (the written record of what Muhammad, the Perfect Man, al-insan al-kamil, said and did). Could Mona Haydar explain this verse, explain who is to kill whom, and why, and what Al-Fitnah is, and what it means to fight certain people until there is no more Fitnah? Youth wants to know, and youth wants to know a whole lot more from Mona Haydar. Take Qur’an 8:60: “Strike terror into the hearts of the enemies of Allah.” This phrase comes up quite often in the Qur’an, and has even been found on the Facebook pages of Muslim killers. Could that phrase possibly mean something like “strike terror into the hearts of the enemies of Allah”? Surely if we Ask A Muslim about anything, we will want to Ask A Muslim about that. And what does “fight in the path of Allah” mean? That’s another phrase that one would like to “Ask a Muslim.” It’s all over the Qur’an. When Mona Haydar stood under that sign, and waited, and chatted about this and that, you can bet that not one of her ill-prepared or simply simple-minded interlocutors asked her about striking terror, or fighting in the path of Allah, or anything at all that had to do with the actual Qur’an, or the real Hadith. Perhaps Infidels ought to come armed for mental combat, and when they stop by the mona-haydars of this world, they will have notecards on which a few excerpts from the Qur’an – 9:5, 9:29, 8:12, 4:76, 4:78 come immediately to mind, but so do many others – have been written down. You can make your own list. And come prepared, too, to ask a Muslim about what 2:256 (“There is no compulsion in religion”) means to Muslims in practice, something so very different from what an innocent non-Muslim would naturally take it to mean. So ask away: who are “those who make war upon Allah and His messenger” and what is meant by “corruption in the land,” the key exception made in 5:32 for killing? Surely these are questions Mona Haydar and all her tribe should be expected to answer. And you might want to ask a Muslim a few questions about Muhammad himself. Why is he called “the Perfect Man” (al-insan al-kamil) and the Model of Conduct (uswa hasana) and what are the consequences of this for Muslims today? And what about all those battles he took part in, listed and described in the Kitab al-Waghazi – what was all that war-making about, so very different from how Jesus spent his days? Yes, and when did Muhammad marry little Aisha, and why does that matter to Muslims today? And why did he take such pleasure in the assassination of the poetess Asma bint Marwan and of Abu Afak, the 100-year-old Jewish man in Medina who just wasn’t sufficiently enthusiastic about Muhammad and therefore deserved death? Or what about the Battle of the Trench, where Muhammad’s men, to his evident pleasure, and apparently Muhammad himself also, decapitated between 600 and 900 bound members of the Banu Qurayza? Or why exactly did Muhammad and his men attack the inoffensive Jewish farmers of the Khaybar Oasis, and how did they divvy up the spoils of war? It should be fun preparing the notecards for these encounters. I urge everyone to go to these Outreach Nights at local mosques (I’ve done it myself, causing great consternation with only an innocent question or two), or these sidewalk encounters with smiling mona-haydars. But now, instead of a jejune farce, you will have a real discussion, one based on adducing what Muslims learn from their reading of Qur’an and Hadith. It will be now not a nonsensical but a salutary encounter, because you – the inquiring non-Muslim — will be cooking with gas when you dare to…. Ask A Muslim. But in the actual event, no one brought up any of these unpleasant details, possibly because they were simply ignorant, possibly because they were recognized only to dismiss the idea that there are “small pockets of hatred here and there.” Mona Haydar does not identify these pockets or find their origins, in any particular faith, but immediately suggests that the victims of such “hatred” must be Muslims because many, though not all, instead of “asking a Muslim,” made comments that were more or less statements of regret over how badly Muslims were treated in this country, and emphasized how important it was for non-Muslims to understand the true, the good, the inoffensive Islam that was embodied in the smiling face of the outreaching Ms. Haydar. There are variations on this theme being played out all over the country. 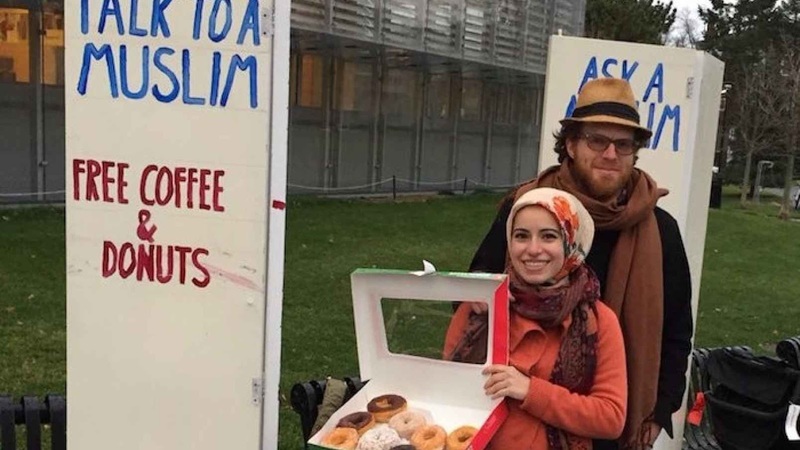 Smiles and wiles, and just possibly, coffee and donuts too, for non-Muslims passing by on the street. And all those members of the local mosque perform an evening’s outreach, where the one thing never to be discussed is Islamic theology, and bromides about brotherhood are the interfaith healing racket’s order of the day, but the chicken and pita are delicious. What more could one ask for?